1 Then I saw an angel coming down from heaven, holding in his hand the key to the bottomless pit and a great chain. 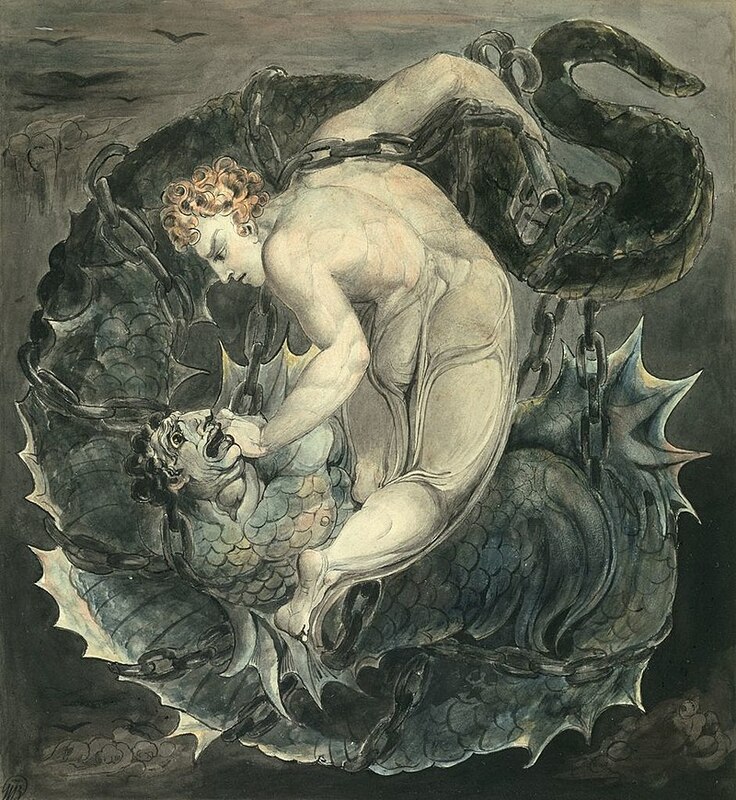 2 He seized the dragon, that ancient serpent, who is the Devil and Satan, and bound him for a thousand years, 3 and threw him into the pit, and locked and sealed it over him, so that he would deceive the nations no more, until the thousand years were ended. After that he must be let out for a little while. 4 Then I saw thrones, and those seated on them were given authority to judge. I also saw the souls of those who had been beheaded for their testimony to Jesus and for the word of God. They had not worshiped the beast or its image and had not received its mark on their foreheads or their hands. They came to life and reigned with Christ a thousand years. 5 (The rest of the dead did not come to life until the thousand years were ended.) This is the first resurrection. 6 Blessed and holy are those who share in the first resurrection. Over these the second death has no power, but they will be priests of God and of Christ, and they will reign with him a thousand years. In a book full of images, metaphors and declarations that have inspired a plethora of theological interpretations and have divided interpreters perhaps none has been as divisive in recent theological movements as the image of the millennium of peace where the devil is confined that we encounter in this chapter of Revelation. The image of the millennium has often been linked, as I will discuss briefly below, to expectations of the advent of an utopian era brought about either by the spreading of the gospel to the ends of the earth, or by the continued social progress toward equality, or by the inbreaking of God’s reign bringing about the long awaited peaceful kingdom imagined in places like Isaiah 2: 2-4. Yet, Revelation is remarkably terse in its description of this time, it is an extended pause between the defeat of the beast from the previous chapter and the binding of Satan here and the final handing over of the Devil, Death and Hades into the lake of fire. In a strange set of visions this is a strange chapter which, like the rest of the book, is permeated with images from scripture recast here in a new form. In the devil’s absence those who God has judged favorably now reign. As Revelation 3: 21 promised the hearers in Laodicea, “To the one who conquers I will give a place with me on my throne, just as I myself conquered and sat down with my Father on the throne.” In another of Revelation’s great reversals those who received a negative judgment from God’s opponents, judgments that may have resulted in their execution, now receive a positive judgment from God by sharing in God’s reign. In the imagery of Revelation this is a first fruits of a larger resurrection that occurs at the end of the imagined millennium, but those who are highlighted here have already conquered and Death, Hades and the Devil (all personified here) have no power over them. Revelation pulls imagery from throughout the Hebrew Scripture (or Old Testament as many Christians know the first two thirds of their scriptures) but the prophet Ezekiel continues to be a source of images that are echoed here in Revelation. Ezekiel 38-39 introduces us to Gog, the land of the prince Magog who attacks Israel and is overthrown by God and here Revelation takes both Gog and Magog and turns them into nations or groups from the four corners of the earth that one final time come to threaten the saints under the influence of the devil. In a military metaphor they surround the camp of the saints to make war upon them but, like the previous battle against the beast in Revelation 19, the saints do not fight, and God consumes these forces and then the devil is thrown into the lake of fire. Revelation, like most of scripture, dwells with the paradox that how one lives matters and the final sovereignty of God to determine any judgment that people would receive. The scope of God’s redemption may be wider than the limits that humans would place upon it. Throughout Revelation the hearers have been encouraged to resist the evil in the society around them and to repent when they fail. Yet, there is an acknowledgment in Revelation of the allure of the society and perhaps the multitude of people may eventually see and wash their robes so that they too may take their place among the uncountable multitude. Even with this image of final judgment, the hope of Revelation is to lead its hearers to repentance rather than resignation. Many people come to Revelation searching for certainty, attempting to divine the exact path of the future and this has led to multiple conflicts and divisions in the church. I’m not comfortable with any of the premillennial/postmillennial patterns of interpretation nor the view of living within the millennium of many earlier Christians for various reasons. Trying to lock down history and say that this is the age where the Devil and the force of evil are imprisoned does not seem to reflect the reality of the pain and suffering in the world, and while Revelation simply assumes the reality of suffering and persecution it does imagine an ending to it. I can’t share the optimism of many seventeenth- and eighteenth-century Christians who felt that they could bring about the millennial age by evangelism and social change, nor can I embrace the pessimism and persecution complex of many postmillennial interpreters. Yet, perhaps there is wisdom in attempting to step back from the trees to see the forest. Revelation as a book was designed to bring hope to its hearers in a time of persecution and struggle and here, at the end of the struggle, is a time of peace and hope. They could hope, as we do, for a time when God’s kingdom would come, and God’s will would be done on earth as in heaven. To paraphrase Martin Luther’s explanation of the Lord’s Prayer, in fact God’s kingdom comes and God’s will comes about without our work and our prayers, but we pray that that kingdom and that work may come about in and among us. However, the ending of the age unfolds, as a Christian I believe that falls within God’s hands. God’s judgment will not be by my standards and yet, God’s will in its own time and manner will be done. When evil can at times seem so pervasive or powerful, I can find hope that God has not abandoned or forgotten the world. Ultimately, Revelation points the faithful to lives of repentance not resignation, hope instead of hopelessness, and to yearn for the promised resurrection and the healing of the world which we get to imagine in the coming chapters. This entry was posted in Biblical Reflections, Revelation and tagged book of Revelation, Postmillenialism, premillenialism, Revelation, Revelation 20, thousand years. Bookmark the permalink.